This week onwards, I will try to introduce you all my PDA's software. I feel this software is excellence for me, especially the non-stylus features. I like the idea of finger friendly controls and arrangement of the navigation. It just good enough to replace windows mobile default navigation way. I can launch my applications with my finger easily. 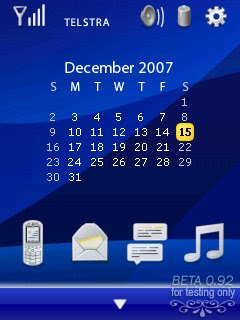 It provide several cool features such as the IPhone-like scrolling gesture, phone lock gesture, and so on. You can easily lock your phone at the top left corner. After locking, the phone will go back to your today wallpaper. Besides, I like the today's 'BIG' icons and menu. At the middle, you can get your digital or analog clock being displayed. 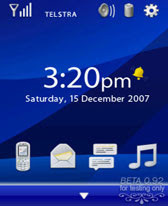 Just scroll your finger from left to right, the middle clock display will goes to next items. To edit or launch the application, just press on the big icon. e.g: the calendar or clock. It will launch the default WM program accordingly. PointUI has a BIG icons at the bottom of the screen. Just press on the icons and it will launch your program accordingly. Try it out, and welcome to share your experience with me by posting a new comment.